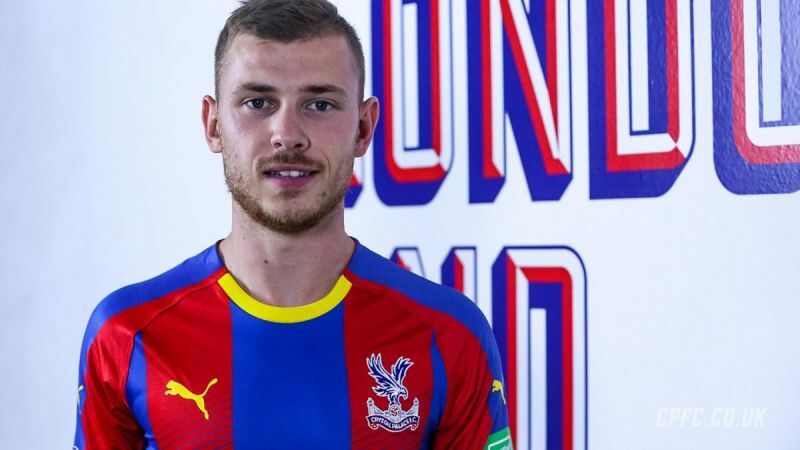 So as you may have guessed, the new premier league star I will be focusing on in this episode is none other than former Schalke & Germany man Max Meyer, who has recently signed for south London side Crystal Palace in what could be seen as the coup of the season. That’s right, Crystal Palace got their man on a free transfer from the German side after he let his contract run down after a dispute with Schalke’s sporting director Christian Heidel which consequently left him out of training for the remainder of the 17-18 season. 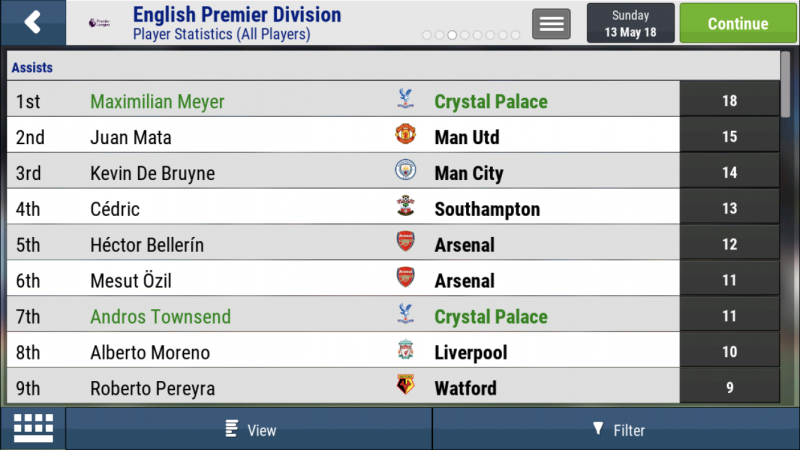 In terms of Palace quality players he looks a quality player, with 14 in dribbling and Passing, 15 in Creativity and 18 in Technique along with a plethora of other decent attributes. In real life Schalke manager Domenico Tedesco started to deploy Meyer more as a Deep Lying Playmaker as he felt the positional change better suited his qualities. I disagree, and I will be playing him as an Advanced Playmaker in the centre of the park. 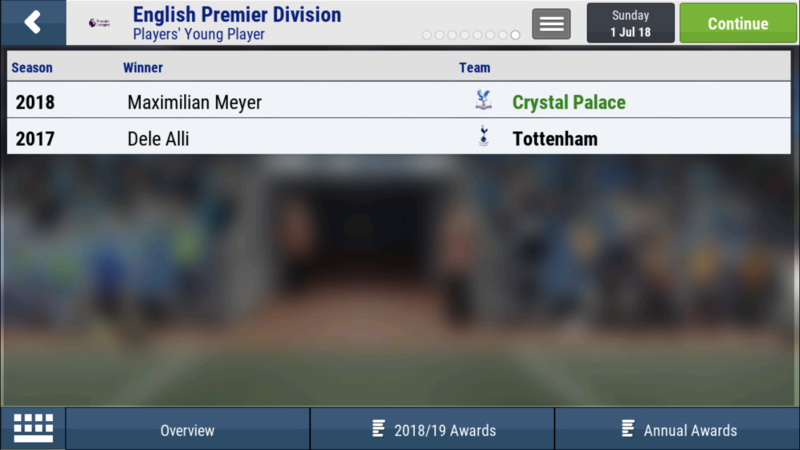 Deployed on the left side of a 4-3-2-1, he would also be taking all set-pieces this season, as I felt that with his technique, creativity and eye for goal it would benefit the team massively. 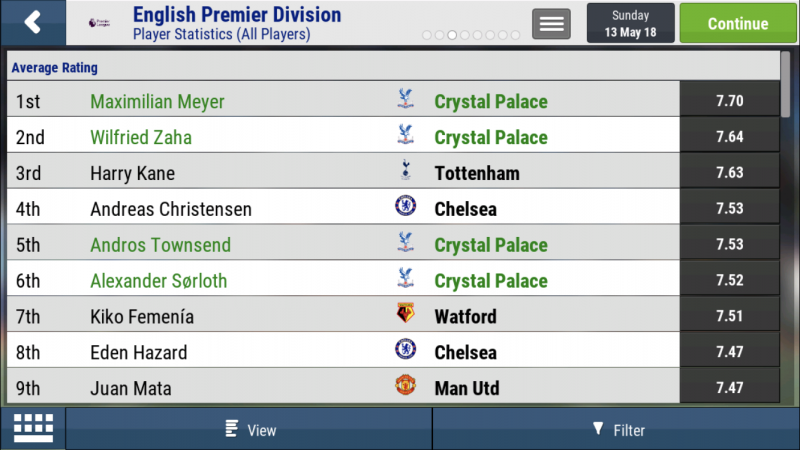 Let’s now fast forward to the end of the season to see just how Crystal Palace, and more importantly Max Meyer got on. 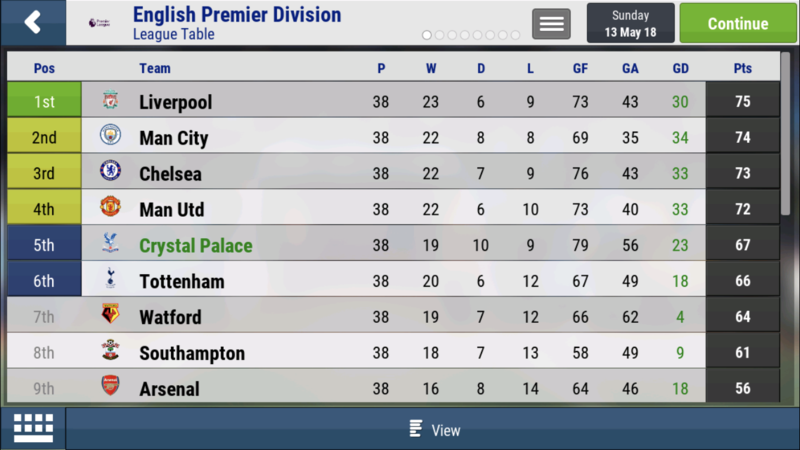 Well it was a fantastic season all around for Palace, as they finished up in 5th placed in the league with a more than respectable 67 points. 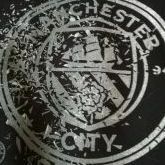 They were the leagues top scorers with 79 Goals and would next season be playing European Football. In the end, too many draws saw them miss out on the Champions League spots. As for Max Meyer, he too had a fantastic season for the club and ended up winning the league’s Young Player of the Year award whilst also winning the Footballer of the Year award. 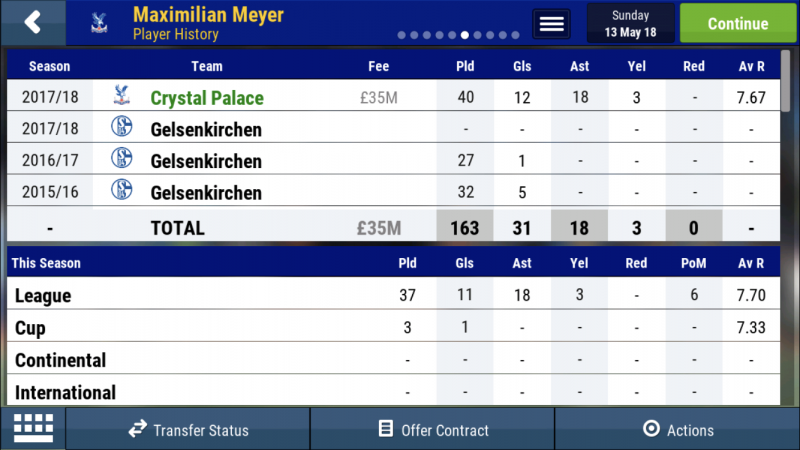 As for his development, well he looks a much better player than when he first arrived at Selhurst Park. 18 in Dribbling and Passing, a full 20 in Technique, 16 and 17 in Creativity and Decisions respectively with his Movement and Teamwork also up to 15, couple all this with his 15 in stamina and he looks a world class midfielder with plenty of room to grow further. 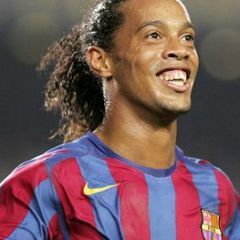 He managed 40 games throughout the season, scoring 12 goals and assisting a further 18. A very very successful signing in my opinion. So Vibe, have Palace pulled off the coup of the summer? 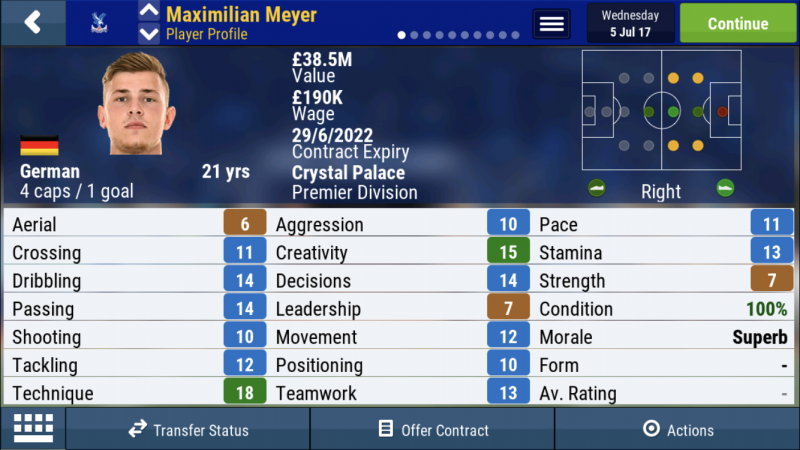 Will Max Meyer live up to his potential at the South side of London or will he just be another one of those players who never lives up to his original hype? Let me know in the comments below what you think. Excellent work mate, I agree this was one of the most surprising steals of the window. It's safe to say if he performs anything like that this season he won't be there long! I agree fantastically well written again. Also agree with @Ashez but it depends on where Roy decides to play him. 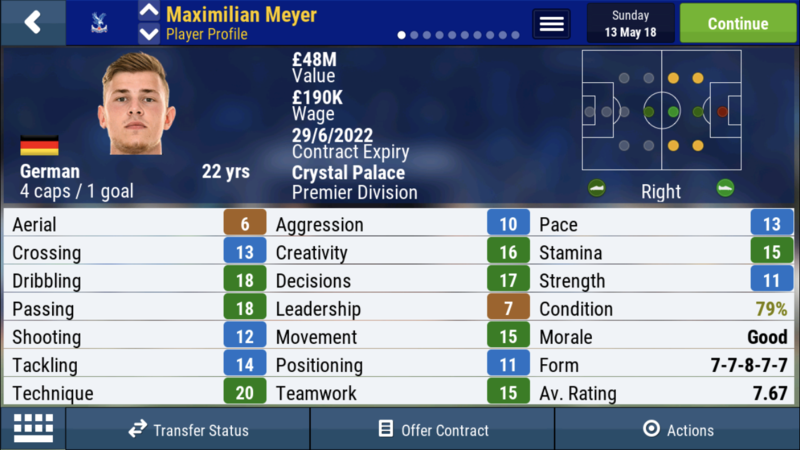 In FMM terms i think you have found his position there and i can see in next years game he will be a force to be reckoned with. IRL I believe he's transitioned into more of a DLP or a general midfielder compared to the AMC type player he was known for. My bad! I read it when it was posted but saved my comment for a bump which at least paid off haha. What tactic were you using? Ah right cheers. Was impressed by how well the team did. 5th first season in the premier league seems incredible for a squad like cardiff's.